When I awoke on Wednesday Oct. 10th, I had no idea what lay in-store for my family or my community. 12 hours later after riding out the storm I began trying to wrap my mind around what had just happened. The next day as I traveled an hour from home to get cell reception so I could call family and let them know we were ok I was unprepared for the devastation I saw. At that moment I had my second experience of being overwhelmed. I began almost immediately to receive calls from friends from previous churches I have served wanting to know how they could help. Then I began to get calls from complete strangers who had been referred to me by a variety of sources. In that moment the body of Christ took on a new meaning for me. People who had up until that moment been complete strangers to me became friends who wanted to walk along side us in our time of need. Included in those phone calls were one from Dr. Tommy Green (Executive Director and Treasurer of our state convention) and one from Lewis Miller (West Region Catalyst) wanting to know first that we were ok and secondly what were our immediate needs. Within 4 days Lewis Miller personally came to see me to provide for specific needs for my family and the next day Dr. Green appeared to discuss how to help our church. I’m not trying to build anyone up I just want our fellow Florida Baptist to understand and appreciate the nature of like minded churches joining together for the primary purpose of sharing the gospel but also to offer support in time of need and the leadership that such an organization requires. I want to mention some churches who immediately reached out to partner with us in the aftermath. 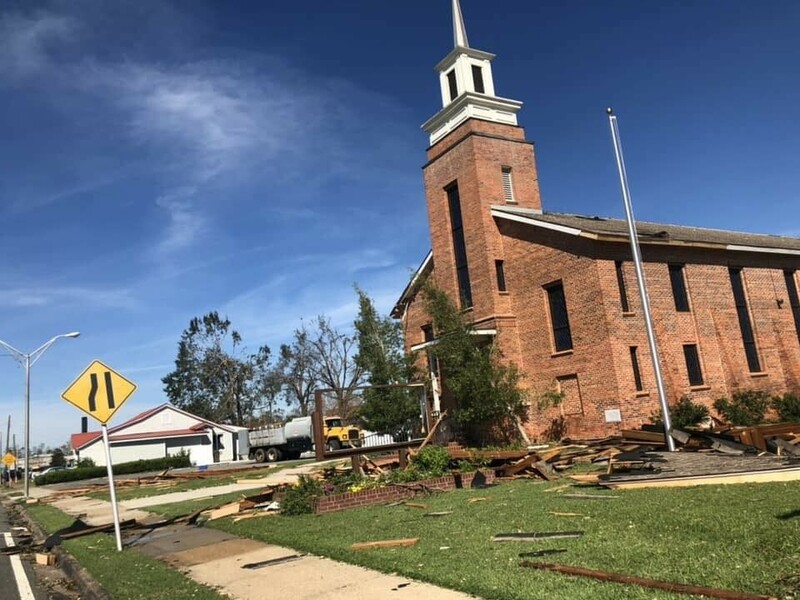 The efforts of FBC Perry, FBC Milton, FBC Bradfordville, Thomasville Road Baptist, Tallahassee and Southwide Baptist in Defuniak Springs allowed us to focus on the needs of the community that has opened many doors of ministry opportunity. These will, I’m sure, lead to gospel opportunities as we move forward. Other churches from Mississippi, Alabama, Texas, Tennessee, South Carolina have aided us in various ways as well as several individuals and businesses too numerous to mention. I do not have time in this format to relay to you the many stories of God at work in the middle of all this but rest assured it includes stories of salvations and people having their needs met. We as Baptist have historically been a fiercely independent and opinionated people but I am glad that we have the ability to focus on what we have in common and come together and achieve great things for God (all through His strength of course). That commonality is, obviously, Jesus and I have found we all like to see Him glorified. And that is happening. This is far from over. I hear of new needs daily and the needs will undoubtedly move from one kind to another in the days ahead. I am grateful to belong to the body of Christ always, but especially in times like these where we watch God turn tragedy into an opportunity to show His love to a world woefully unaware it exist. So the next time you write a check to the Cooperative Program think of a grateful Pastor and his church who were able to stay focused on serving people in the name of Jesus because we had been taken care of by your generosity.